Yesterday the weather was cooler, but I stayed indoors most of the day. I wrote a couple of posts, one of which had to do with the bereavement group, The Compassionate Friends, that meets the first Tuesday of every month in Santa Clara. I said it didn’t ‘hold appeal’ for me. One of the reasons is that they have a kind of a ceremony they do at the start of every meeting. They light candles and recite first the birth dates and then the death dates of those now gone for that month. When I stopped going to my original bereavement support group early this year, I felt that there was too much emphasis on sorrow and not enough on looking forward. I told my Rosalie story to them . . .
. . . and it didn’t seem to have any effect. Well, why should it? Perhaps I should have given it more time, Perhaps grieving is different for everyone and that’s not their style. At The Compassionate Friends, I found a group that fit my mindset a little better. Their stories were all stark, like mine, of lives ended before their potential could be reached. But the dates thing has bugged me. So far, neither of Zach’s dates have come up but I’ve found myself wondering what I would do when they did. Would I skip those months? I know early on, anniversaries were important to me. Now, the loss of Zach has all settled into a kind of dull ache that flares up every so often. Plenty of things remind me of Zach without adding reminders of his death date. On the other hand, there was a moment last spring at the Compassionate Friends when I thought I could see myself as a kind of elder who could support those whose grief was fresher. Looking ahead to my schedule for the rest of the year, all the first Tuesday evenings are impacted one way or another. I don’t think I’m invested enough to make a heroic effort to get down there. Pace Virginia and Don. All the bereavement support groups meetings will stay on my schedule so it’s possible I will go to another one this fall. My follow up session with Linda was scheduled for Wednesday afternoon so I’ve been trying to focus on the idea of ‘goals’ again. All in all I feel pretty good about how the summer went: Jeremy’s move and the Germany trip. The last two weeks I’ve worked a standard 8-5 M-F schedule which is draining in a way but I felt I handled it pretty well. Now that I’m back, it’s the turn of the other two principals at Davies to get holidays. Arno is leaving Tuesday for his usual driving trip to the Midwest. He’ll be gone five weeks. Jim, after shocking us all last year by cutting his schedule down to a ‘normal’ 40 hour week, announced he’ll be taking the month of October off completely. There are others who can and will step up to help with the shift coverage, but at the moment, it looks like the bulk of it will fall to me. So I decided my ‘price’ will be a couple of weeks off in November. I will always want to visit Jeremy and Ashley and Rosalie but I also have an unfulfilled promise to visit Peter and Nanci in Spokane. And I like to stop in on my cousins Dan and Nettie also in Spokane. Is this a goal worthy of discussion? Honestly, I don’t know how Linda would respond to this. I emailed her the other day that I was cancelling the session since I had been scheduled for work at that time. She hasn’t responded. The bereavement group that seemed so promising a few months ago doesn’t hold appeal. Since I’ve been back I’ve had one day where I had a lot of time to do things and I didn’t and I felt bad about it. All the old thoughts about how I should use my time better and what those uses should be came and went. Then the next day I went to work. I feel good that I’ve been posting pretty regularly since I got back. I feel good about being in the Skyline band again. (At the request of Zack I’m playing bass this semester.) I feel good that I have a handle on how much work I have in the weeks ahead. It’s more than I would like but if the payoff is two weeks off in November I’ll take it. Jeremy tried unsuccessfully to call me this week two times when I said I was available so I felt bad about that. Then we had a nice Skype session Friday night so I felt better. He’s having a tough time getting a decent job. Ashley is very happy with her new teaching setup but that cuts both ways with Jeremy. I don’t have a magic wand to make it all great. That would cut both ways too, I guess. I went to the South City bereavement group yesterday. I had gone quite a bit last year but fell away from it last fall. The regular facilitator, Tracie, wasn’t there which disappointed me. I felt she was a big reason why the group was successful. I remembered about half of the people there from before. One woman whose 15 year old son jumped off the Golden Gate Bridge was approaching the second anniversary. Everyone else had lost a parent or partner to age or illness. I guess I was in a manic phase, because when it my turn to speak, after narrating the bald facts of Zach’s death, I spoke about Rosalie and her positive approach to life. At no point was I near tears as many others were when telling their story. It struck me that some who were long time attendees were perhaps thinking too much about the past and not enough about the future. It sounds cold but I am only speaking in relation to me. Their grief is theirs and it is not for me to prescribe their reaction to it. Anyway, I think I will probably never return to that group. It was important to me for a while and I fully respect what they are doing. Indeed, in my talks with two new therapists in the last week, I credited the group with some key insights. In fact, I mentioned that to the group as well yesterday. The idea that we have to reinvent ourselves after a death was one I got from them. I would even go so far as to say that’s a key concept behind this blog. Speaking of therapy, I had my last session with Dr Perry and my first with J, the MFT, this week. Maybe my manic phase was due to my three therapy appointments hard upon one another. It nice to have someone listen to you! I’ll give J another session or two before deciding whether to continue. I didn’t get the instant comfort level that I did with Dr Perry but the circumstances are different now. She is young but treated me seriously. At one point she made reference to her own depression so there may be depths there that I haven’t seen yet. My sister Jane had been saying for some weeks that she wanted to visit Zach at my house before we all took his ashes away. I called her yesterday morning to remind her that time was getting short and she was able to stop by later in the day. Earlier, I had offered up several options for her visit, thinking that she would want private time but in the event she and I just talked. We didn’t talk a lot about Zach per se, as one might at a wake, but more about our reactions to his death and the arc of our griefs. She cried a little but I was strangely calm. I was able to talk about how I had cried so much in the early days and then as time passed I cried less but then I felt that not crying was to somehow invalidate the grief. I’ve learned that grief has no time line nor is there any formula for it. When I’ve cried recently it has been triggered by some random thing not directly related to Zach. I told her about the Bereavement Support Group I have been going to and said that it was open to her as well if she wanted. We talked about souls and what they might be really. What is the difference between a living person and his earthly remains, be it a body or a box full of ashes or a headstone somewhere? My contention is that the things that Zach touched and were part of his life – his clothes, his books, his computer, his phone, etc. – are just as much Zach as his ashes. His ‘soul’ is his memory within those who are still living and all of those things contribute to his memory. 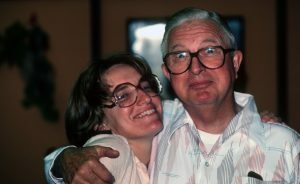 Jane saw a picture I had of our beloved Uncle Bob who died in 1999. She commented that there really were very few family members who had died in her adult lifetime and she didn’t know how to react. We’ve had Aunts & Uncles die in the last 10 years ago but they were in other states and we weren’t close. None of us kids went to the funerals. Our grandparents have been dead for more than 20 years and they all lived far away. I remember thinking something similar years ago: that I’ve lived a charmed life and no one really close to me has died. It’s not really true; I’ve lost colleagues, some to age, some to suicide, some to AIDS, but no one I was really close to personally. I’ve been to some funerals now.